Are Killjoys Opposed to Backyard Trampolines? The big debate over trampoline safety is important but often distorted. So often news accounts are written from the perspective of the dangers they may present more than the fun they provide. Many who condemn home trampolines take a very different view about bikes, which can also be dangerous… Or contact sports… Or playgrounds. When properly supervised and equipped with netting tramps can be a terrific source of fun for kids. But yes, they do present dangers. A question worth asking is whether we value play as much as we should? Are we trying to control and even squelch the joyous, spontaneous things our children get up to? INDIANAPOLIS — Boing, boing, boing … OWW! could be the anthem of the trampoline jumper — and that’s a good reason to ban the things, said an Indiana University researcher. 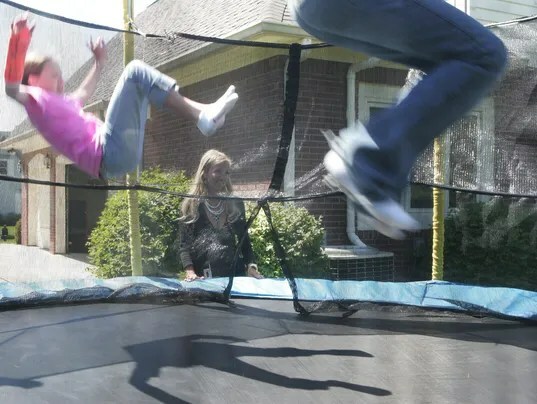 A new study from an Indiana University School of Medicine researcher finds that from 2002 to 2011, accidents on backyard trampolines accounted for nearly 289,000 visits to emergency rooms for broken bones. Factor in all accidents, not just fractures, and the tally rises to more than 1 million ER visits, according to the study which published online in the Journal of Pediatric Orthopaedics. His study, the first to look at fractures related to trampoline use nationwide, found that over 10 years, trampolines caused an estimated 288,876 fractures, at a cost of more than $400 million. Trampoline injuries overall led to more than $1 billion in emergency room visits. Loder, a surgeon at Riley Hospital for Children at IU Health, decided to do the study after seeing an increase in the number of patients with fractures suffered in backyard trampoline accidents. The American Academy of Pediatrics has recommended against backyard trampolines since 1999, and many homeowner insurance policies either prohibit them or have a clear exclusion for trampoline injuries. Still, that doesn’t stop parents from purchasing them. Kids need to be healthy and active, but this is not the way to do it. And some, such as Mark Publicover, dispute how dangerous trampolines are. Publicover invented the trampoline safety enclosure about 15 years ago and founded JumpSport Inc., a San Jose-based trampoline company. If you compare the number of hours children spend jumping on trampolines compared with the time they spend in other activities such as biking or swimming in backyard pools or playing on swing sets, trampolines cause much fewer injuries, Publicover said. “If you look at all of the high energy activities kids can play in, trampolines end up being pretty much the safest things that they can do,” said Publicover, who broke his leg on an earlier generation trampoline. Eight years ago Jason Reese, a personal injury lawyer in Carmel, Ind., purchased a trampoline for his three kids, now 14, 11 and 9; two years ago he replaced it with a large one he considers safer. He also hires an inspector to check the net once a year. Strict rules govern the use of the Reese family’s trampoline. No more than four kids at a time. A parent must be home. Don’t bounce against the safety net. And no one is to go airborne. The only injuries from their trampoline? A few bloody noses. Still, he’s amazed at what he sees in other people’s backyards, from trampolines that have no nets, to those that sit on uneven surfaces to trampolines with decaying mats that provide iffy support. Little surprise that stories about trampoline-related injuries are rife in the suburbs. According to Loder’s study, which included data from 100 hospitals nationwide, the number of injuries peaked in 2004 with about 110,000. Since then, the number has slowly dropped to an estimated 80,000 injuries in 2011. If you look at all of the high energy activities kids can play in, trampolines end up being pretty much the safest things that they can do. Safety enclosures like the one Publicover invented, now standard on trampolines, no doubt have had much to do with the reduction in injuries, he said. By 2004, 75% of trampolines had safety enclosures. At the same time, sales had gone from 600,000 a year just a few years ago to 1.2 million, Publicover said. Doctors, however, would prefer to see much fewer injuries. The most common trampoline-related injury that Loder sees at Riley is an elbow fracture, which in some cases requires immediate surgery. Knee fractures that threaten growth plates and require surgery also are common, he said. On average, patients were 9 years old; though those who have injuries of the spine, head, ribs and sternum — accounting for 4% of the injuries seen — had an average age of nearly 17, perhaps because they are bigger and can jump harder. The study looked only at backyard trampolines and did not include trampoline parks. Almost all of the fractures, 95%, happened at the injured person’s home. Loder does not question the appeal of trampolines, just whether they’re worth the risk.